TravelSafe Insurance Review: A Proven Policy Provider? Home > Travel > TravelSafe Insurance Review: A Proven Policy Provider? Shopping around for travel insurance for your next big trip? TravelSafe Insurance is one of the big-name companies in the industry, but just what do you get with TravelSafe? Will this provider give you the reliable coverage you need, or are their policies a potential pitfall? Here’s a comparison of TravelSafe’s major benefit limits per plan. You can upgrade their Classic Plan to include cancel for any reason coverage; otherwise, the Classic and Classic Plus plans are the same. Note: You must purchase cancel for any reason benefits within 21 days of making your initial trip deposit. The following benefit limits are per person. View all benefits here. Refer to our terminology section to get definitions and more details on benefits. * To qualify for a pre-existing medical condition waiver, you must purchase your plan within 21 days of making your initial trip deposit. Pricing varies widely depending on where you’re traveling, the age of travelers, your state of residence and other factors. Sample pricing below is based on an insurance policy for two adults, ages 40 and 45, who reside in Virginia, are traveling to Greece for one week, and paying a total of $8,000 for the vacation cost. Pricing is the cost for both travelers (not per person). Not sure that you even need travel insurance? Check out the brief video below to see some typical examples when having travel insurance can pay off. 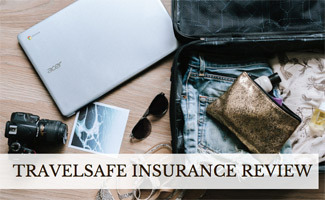 We highly recommend TravelSafe Insurance for their comprehensive coverage rates, long-standing reputation and excellent customer support and travel services. Their Classic Plus plan, in particular, is a great value. It includes cancel for any reason coverage at a very competitive policy price. If you want to compare TravelSafe to other travel insurance companies, be sure to read our Best Travel Insurance Reviews, where we give you pros and cons, key features, a handy comparison table and much more for 10+ of the top providers. What great adventure are you looking to insure and why?